Krill oil, a relatively new supplement that people use for the same reasons they use fish oil, is a great source for healthy omega-3 fatty acids. Medical evidence shows that krill oil may help you lower your levels of so-called "bad" cholesterol. It may also help you with joint pain and help with generally with lowering inflammation. Although krill oil isn't as readily available as fish oil, you can find it in most health food stores and online, mostly in capsules but occasionally in liquid form. Here's everything you need to know about krill oil in order to determine if it's something you want to add to your daily routine. Krill are small, shrimp-like creatures found almost everywhere in the world's oceans. They are crustaceans, which means they're related to shrimp, crabs, lobsters, crayfish, and even barnacles. The word "krill" is Norwegian for "small fry of fish," and krill are in fact small. The largest krill is only around 2 inches long. Lots of animals eat krill, including fish, whales, penguins and other sea birds, and seals. Most krill that are fished commercially comes from Antarctica and from the north Pacific, and Japan is the world's top harvester of krill. To make krill oil, manufacturers extract the oil, usually by cooking and then pressing the krill. It's also possible to extract krill oil from harvested krill via centrifuges. This may be done on board fishing vessels or on land. Some manufacturers also use chemical solvents to separate the oil from the krill. Since krill oil is a type of fish oil, it has a similar nutritional profile to other types of high omega-3 fatty acid oils. For example, it has around 14 calories per tablespoon and is lower in saturated fat than some other types of oil, with around 3 grams per tablespoon. It's high in monounsaturated fat and polyunsaturated fat. People take krill oil because it's high in omega-3 fatty acids, which are found in fish and in some plant products, such as flaxseed. The two main omega-3 fatty acids found in krill oil are eicosapentaenoic acid (EPA) and docosahexaenoic acid (DHA). EPA and DHA each play important roles in your various body systems, including in your brain, your eyes, your cardiovascular system, and your immune system. Your body produces a little bit of both EPA and DHA, but not very much, so it's important to get them from your diet. Although krill oil is a relative newcomer to the supplement industry (fish oil, especially cod liver oil, has been around for much longer), researchers have taken a fairly close look at its potential health effects and health benefits. Here's a rundown of the potential specific health benefits of krill oil and how the research compares it to fish oil. Many studies show that eating lots of fish can protect you from heart disease, primarily from lowering your levels of so-called bad cholesterol and by reducing inflammation. Researchers have studied whether taking krill oil supplements would have the same effect. One study published in the journal Nutrition Reviews concluded that krill oil supplementation may reduce two types of "bad" cholesterol, low-density lipoprotein cholesterol and triglycerides—although more research is needed to prove the effects. Another group of researchers, writing for the medical journal Hospital Pharmacy, reviewed the science behind krill oil and concluded that it's a promising but as yet unproven supplement. Therefore, the bottom line is that krill oil may help with cholesterol and heart disease, but is still unproven for those medical conditions. Omega-3 fatty acids lower inflammation in the body, which may help people with arthritis. Again, studies have shown this effect in people with a diet high in fish, and scientists are beginning to explore whether krill oil also might have this effect. A report published in PloS One looked at people with mild knee joint pain in a clinical trial that compared krill oil to a placebo. The researchers enrolled 50 adults between ages 38 and 85 who had mild knee joint pain and split them into two groups. One group consumed 2 grams per day (a little less than half of a teaspoon) of krill oil, while the other group consumed an identical-looking and identical-tasting placebo. Those who consumed the krill oil for 30 days showed more improvement in pain and stiffness than those who got the placebo. Additional studies of krill oil specifically and omega-3 fatty acids more generally that have been performed on both animals and people also have shown some effects on markers of inflammation. Reducing your levels of overall inflammation may have a positive effect on more than your joints—it may also help to reduce your risk for many serious diseases including heart disease, cancer, autoimmune disorders, and even depression. However, it's not clear yet whether consuming krill oil supplements may help with those conditions, and even if it does, what dosage would be necessary for beneficial effects. There's some evidence that krill oil may help women manage symptoms of premenstrual syndrome (PMS) and period pain. The study, published in Alternative Medicine Review, looked at a specific brand of krill oil, Neptune Krill Oil, and compared it with omega-3 fish oil. A total of 70 women took either the krill oil or the fish oil for three months. Analysis of the data showed that women taking the krill oil were less likely than the other women to turn to over-the-counter medicines like ibuprofen and acetaminophen to manage their period pain. Questionnaires meant to assess PMS symptoms also showed improvement in the group of women taking krill oil. The companies marketing krill oil maintain that it's superior to fish oil in several ways. Basically, krill oil is said to be more bioavailable, which means it's easier for your body to use. It's also said to be higher in astaxanthin, an antioxidant compound that may help your body defend itself from toxins in foods and in your environment. Do these claims hold up? The results are mixed. At least two different studies have concluded that krill oil may be more bioavailable than fish oil, but both groups said more research is needed. Another study said it isn't significantly more bioavailable. As for astaxanthin, research has shown that krill oil contains more astaxanthin than fish oil (which is logical, because astaxanthin is the compound that gives krill, shrimp, and salmon their red coloring). However, it's unclear what health effects the extra astaxanthin might have when taken in the form of a krill oil supplement (as opposed to eating the whole fish that contain the astaxanthin compound). Who Should Take Krill Oil? Nutritional experts advise most people to eat at least two servings of non-fried fish per week. However, many people don't get enough fish in their diets. If you're one of them, you might consider taking krill oil supplements. Research has shown that krill oil likely will help you boost your levels of the important omega-3 fatty acids EPA and DHA. 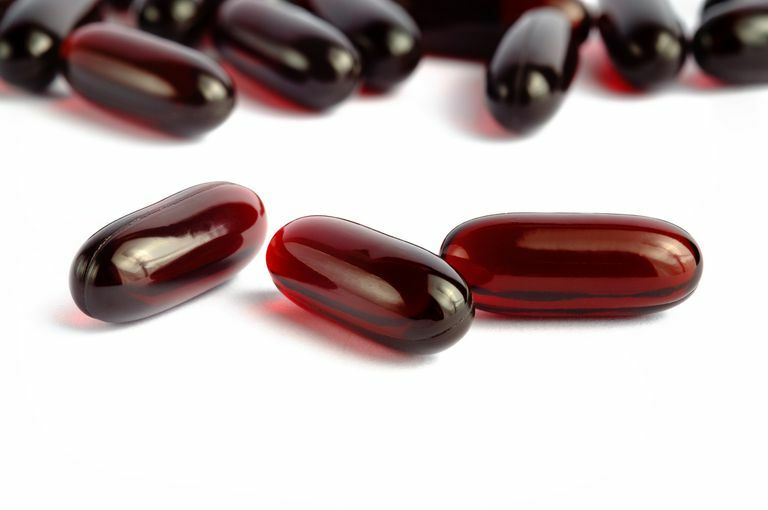 Krill oil is mainly available in capsules and manufacturers tout that as one of its advantages—drinking liquid fish oil from a spoon (as opposed to in gelcaps) does not appeal to some people due to its strong flavor. In addition, krill oil manufacturers boast that their products don't lead to "fishy burps," a problem noted by some people who take lots of fish oil. If you experience any of these side effects, discontinue taking the supplement and talk to your doctor about it. There may be a different brand or a different form of omega-3 fatty acid supplement that will work better for you. In addition, krill oil's safety in children hasn't been studied, and women who are pregnant should talk to their doctors before taking krill oil. In addition, people who are having surgery should avoid krill oil for two weeks before and after their operations. Although krill oil has no known interactions with prescription drugs, you also should talk to your doctor about any drugs you're taking before adding krill oil to your regimen. If you take krill oil and then experience sudden symptoms that involve trouble breathing or swelling of your lips and face, seek emergency medical care, as you may be having a life-threatening allergic reaction. The supplement industry is largely unregulated, so it's difficult to determine the quality of a product such as krill oil. Generally, you should look for supplements that have been certified by the United States Pharmacopeia (USP) or NSF International. These are independent quality assessment groups that test products to make sure they contain what their labels say they contain. Most importantly, talk to your doctor before adding any supplements, since they may have risks you're not expecting. National Institutes of Health Office of Dietary Supplements. Omega-3 Fatty Acids fact sheet. What Medical Conditions Can an Astaxanthin Supplement Prevent? Can I Take Omega-3 Supplements Instead of Eating Fish? Can Adding Mangosteen to Your Diet Help Your Health Conditions? Can the Wine Antioxidant Resveratrol Help You Live Longer? Can Sweet Oil Cure Your Ear Pain? Why Is Olive Oil So Heart-Healthy?